All my boys enjoy the CBeebies program Octonauts. I also enjoy it as it contains a lot of marine science. Once you skip past the fact that a penguin and polar bear live happily together in a submarine type vechile, it demonstrates teamwork and is full of fascinating facts about sea creatures. I have even googled a blob fish to show my husband that they are real creatures. Little man is currently the most obsessed of the three with the program and spends hours in the bath playing with his gups. When I was offered the Fisher-Price Octonaut Gup Speeders to review, I was interested to see if they held his attention as much as the bath toys do. The speeders themselves are like little cars, octonaut style. They have barrel wheels to make them move. The boys loved them from the moment they saw them. I mean they are pretty cute aren't they? Middle man decided that Tunip and Inkling were his. They particularly like them as they are small and therefore can be easily held in their hands. 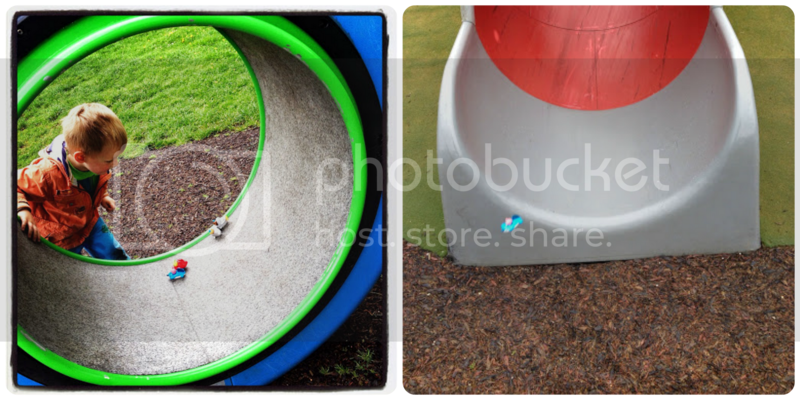 They insisted taking them to the park and rolling them down the slide. We used the speeders and launcher to make a little game where the octonauts needed to save the sea star (from one of our many other sets) seeing who could get their speeder the closest. The only downside with the speeders is that you need a flat surface to use them on so carpets are out. Luckily we have laminate downstairs so the only problem is needing to retrieve them from under the sofa. They don't have the flexibility of the standard gups that can be used in and out of water but I think these are a nice addition to the Octonauts range of toys from Fisher Price. I am sure that any Octonauts fan would like these lovely little speeders. Now to the launch bay! We were given the toys for the purpose of this review but the opinions contained here are my own. What a great review and lovely photos too thank you! Your little man looks like he is having great fun! We have a laminate floor in our conservatory and my boys are always building ramps and 'jumps' for their cars! These look to great fun and educational too ! I wasn't sure if they would be any good. But is a boy likes cars and octonauts then it is pretty much going to make them happy. They look like fun! We have a tiled kitchen floor that I can imagine them just flying across! Great review, looks like lots of fun was had. They look really cute, aswell as fun! Our two littlies love Octonauts.